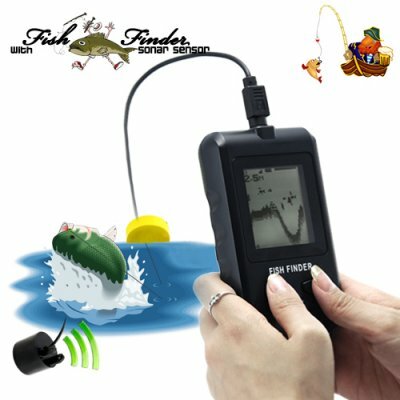 Successfully Added Fish Finder with Sonar Sensor (2.8 inch display) to your Shopping Cart. Fish Finder with sonar technology and highly detailed 2.8 inch display. This fish finder can be used in any ocean, river or lake and is fantastic for detecting schools of fish in any particular area by use of sonar technology. Along with fish location, this fish finder also display water depth, water temperature, water bottom contour, and much more, so you have all the information you need to capture the snapper that keeps getting away. The detailed dot matrix display on this fish finder will show anything in the water from up to 73 meters deep and can differentiate between fish and junk. Now you can see on the LCD screen if there is anything worth catching in the area or if you need to stop wasting your time and move to another location. This fish finder also has an Anti-UV screen, which means a clear and visible display even when the sun is glaring at you. This cool fishing gadget has revolutionized fishing for millions of people world wide. Place your orders today while supplies last and we will express ship it to you by tomorrow. This fish finder comes with our famous 12 month guarantee and is in stock now in our warehouse right now. Brought to you by the leader in wholesale electronics, Chinavasion. Yes, the fish finder can handle temperature of -20°C to +70°C (-4°F to 158°F). Note: Do not place the Sonar sensor directly on an icy surface, cut a whole in the ice first and then place the sonar in the water.